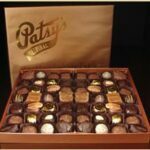 The Ultimate gift for the gourmet chocolate lover. 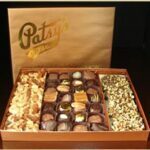 This gift box includes a full pound each Patsys fine handmade chocolates, Almond Toffee and Fresh Nuts. The perfect fine chocolate gift. 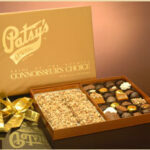 Patsy’s Connoisseur’s Choice collection is the perfect gift for gourmet candy-lovers. 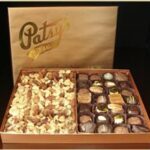 All Connoisseur’s Choice gift boxes include Patsy’s assorted chocolates made with fresh, fine ingredients. Every piece exquisitely made. Choose a combination of rich buttery toffee with its golden center dipped in thick milk chocolate and topped off with a generous coating of roasted first quality almond. 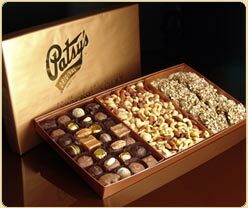 Or fresh delicious mixed nuts, or both for the ultimate indulgence. A pleasure to give and pure joy to receive. The perfect fine chocolate gift.